The War Refugee Board released a detailed report about mass murder by gassing at Auschwitz and Birkenau. By 1943, Nazi atrocities against Jews in Europe had been widely reported, but it wasn’t until early 1944 that the Allies received increasingly explicit information about the process of mass murder by gassing carried out at Auschwitz-Birkenau. 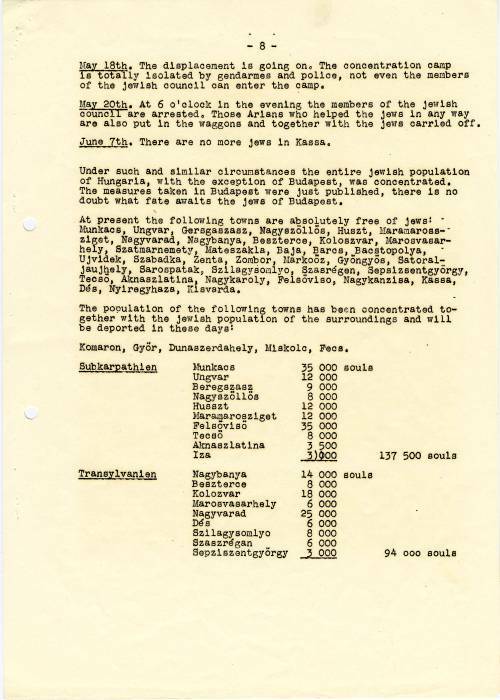 Between June 18 and June 22, 1944, media channels in Switzerland began a worldwide press campaign to publicize the Auschwitz Report, originally written by two Slovak Jewish prisoners following their escape from Auschwitz on April 7, 1944. The report provided some of the first reliable eyewitness accounts of the extermination camp, and detailed the process of selection and murder of Jews in the camp’s gas chambers. On November 26, 1944, the War Refugee Board released the full report to the American press in a deliberate effort to raise awareness and strengthen public support for rescue efforts. At roughly the same time as the report’s release, between late April and early July 1944, approximately 426,000 Hungarian Jews were deported to Auschwitz, where the SS sent approximately 320,000 of them directly to the gas chambers. June 1944 - July 1944 News articles, editorials, op-eds, letters to the editor, and cartoons about a German extermination camp at Auschwitz-Birkenau. November 26-28, 1944 News articles about the German extermination camp at Auschwitz-Birkenau. November 27, 1944 - February 1945 Editorials, op-eds, letters to the editor, and cartoons reacting to news of a German extermination camp at Auschwitz-Birkenau. Berenbaum, Michael, and Yisrael Gutman, eds. Anatomy of the Auschwitz Death Camp. Bloomington: Indiana University Press, in association with the United States Holocaust Memorial Museum, 1998. Cywinski, Piotr, Piotr Setkiewicz, and Jacek Lachendro. Auschwitz from A to Z: An Illustrated History of the Camp. Oswiecim: Auschwitz-Birkenau State Museum, 2013. Dlugoborski, Waclaw, et al. Auschwitz, 1940–1945: Central Issues in the History of the Camp. Oswiecim: Auschwitz-Birkenau State Museum, 2000. Gilbert, Martin. Auschwitz and the Allies. New York: Holt, Rinehart, and Winston, 1981. Neufeld, Michael J., and Michael Berenbaum, editors. The Bombing of Auschwitz: Should the Allies Have Attempted It? New York: St. Martin’s Press, 2000. Swiebocka, Teresa, ed. Auschwitz: A History in Photographs. Bloomington: Indiana University Press; Warsaw: Ksiazka i Wiedza, 1993.